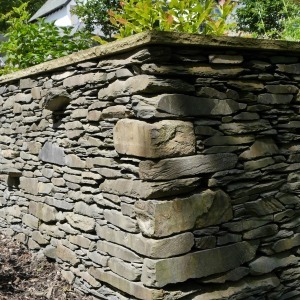 The Dry Stone Walling Association of Great Britain’s Master Craftsman Certificate is the highest qualification available in the craft of dry stone walling. The test itself has been developed over many years to reflect the skills required of a craftsman working at the very top of his game. At Master’s level the candidate is required to construct a set of pre-built features similar to the advanced test, which need to be successfully marked before moving on to the timed test. In this article I will deal with the pre-built features that constitute Part A of the DSWA Master Craftsman Test, I will deal with the timed test also called Part B next time. 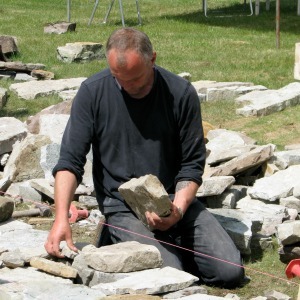 To complete the DSWA Master Craftsman Test the candidate must build four dry stone features chosen from the groups set out below. Three of these features are prebuilt and submitted for examination as Part A of the test. The fourth feature is to be built as part of the timed test (Part B). As can be seen there is no choice in group D as the sloping ground element is a compulsory feature. 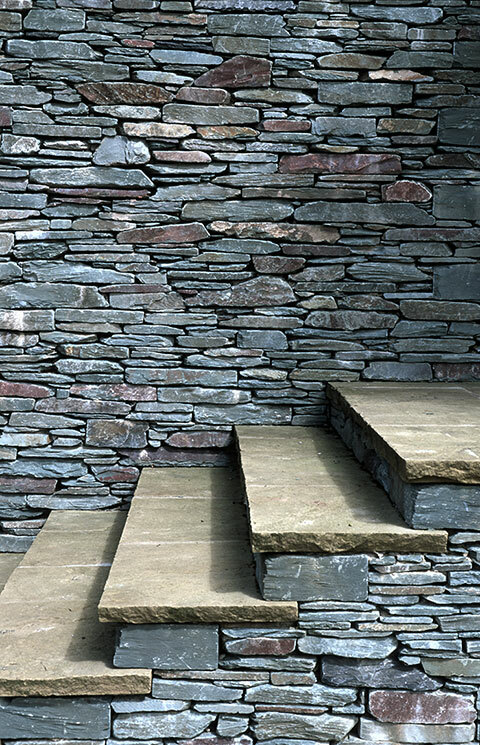 At this point the candidate must select his or her chosen features; these choices may depend on many different considerations such as the type and quality of stone available. Perhaps the most important consideration is which feature is to be carried over and attempted in Part B the timed test. Personally I would favour the square corner or perhaps the step stile as I consider both fairly straight forward to build, both in terms of skill and materials required, although this is a matter of personal choice. Which ever feature is decided upon for the timed test will almost definitely be the factor that dictates the other features attempted in Part A.
I am not going to go in to detailed descriptions of how to construct all these features as at Master Craftsman level the candidate should have a good working knowledge of most of these and if not I would hope they would be confident to have a decent stab at them. I will though go through them and offer some brief observations and comments. 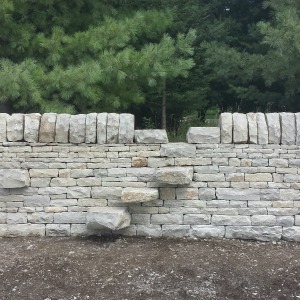 Round Corner – This is obviously a good choice if no decent corner stones are available. A round corner is obviously tighter than a mere curve but must display the same smooth curved surfaces without flat or faceted areas on the face of the wall. A good even batter must also be achieved, hopefully without the use of strings and bars. I do not have an image of a round corner at the moment but I will add one next week as one is being built at home. Square Corner – This is a very basic straight forward feature, familiarise yourself with the method of setting up the lines and pins or frames to enable the corner to be built accurately. 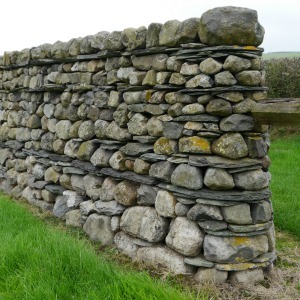 Round End – The round end is usually found where no long stones are available to form wall heads. It is an attractive and unusual feature that can be built from both coursed and random material, although if being built from random material some flat stone is generally required to help tie the structure together. Ensure the batter of the wall follows round from both sides to the end. Step Stile – Again the step stile is a fairly straight forward feature, although it must be robust and well built to withstand the weight of people passing over it. No movement of any of the stones whatsoever is acceptable. There are also several dimensions that need to be considered if this option is chosen. The steps must be no more than 200mm apart and protrude approximately 250mm from the face of the wall. It is also important that the steps overlap so when viewed from above there is no gap between that would allow someones leg to slip between them. 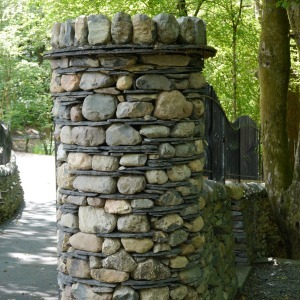 Squeeze Stile – There are many variations in the design of squeeze stiles, although most will include wall heads of some description, these must be tight and well tied back and obviously the stile must allow the passage of pedestrians but not stock. Set of Steps – This is not an option I would recommend for a timed test but it often makes a good choice for a Part A feature. Again with this feature there are some dimensions that need consideration, there must be at least four steps with a minimum width of 600mm, the treads must be a minimum of 300mm and the rise a maximum of 225mm. 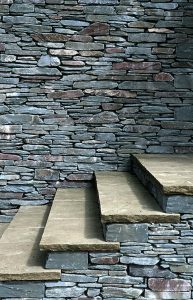 Obviously all the risers should be of an equal height and the treads should be built into and be integral to the surrounding stonework. Round Pillar – Again perhaps not the best choice for a timed test but an attractive stone feature nevertheless. Not unlike the round end this feature can be built from random or flat bedded material, although if using irregular stone some flat pieces will be helpful.Round pillars can be built with a batter or plumb sided depending on the situation.The test requires a minimum height of 1.3 metres and a minimum face area of 3.6 sq metres. 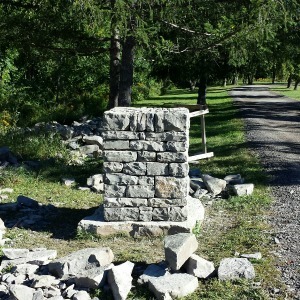 Square Pillar – I have recently seen this successfully completed as a timed test, not something I would have necessarily recommended beforehand but now definitely a viable proposition given the right stone. Whether random or coursed obviously a lot of quoins are required to form the corners, again like the round pillar it can be battered or plumb to suit the situation. The test requires a minimum height of 1.3 metres and a total face area of 3.6 sq metres. Arch – The arch can be centred or corbeled but its span must be at least 600mm; this is slightly misleading as in the Craftsman Certification Scheme booklet it currently states the arch must be 600mm above the ground which is obviously incorrect (this will be remedied at the next reprint of the booklet). 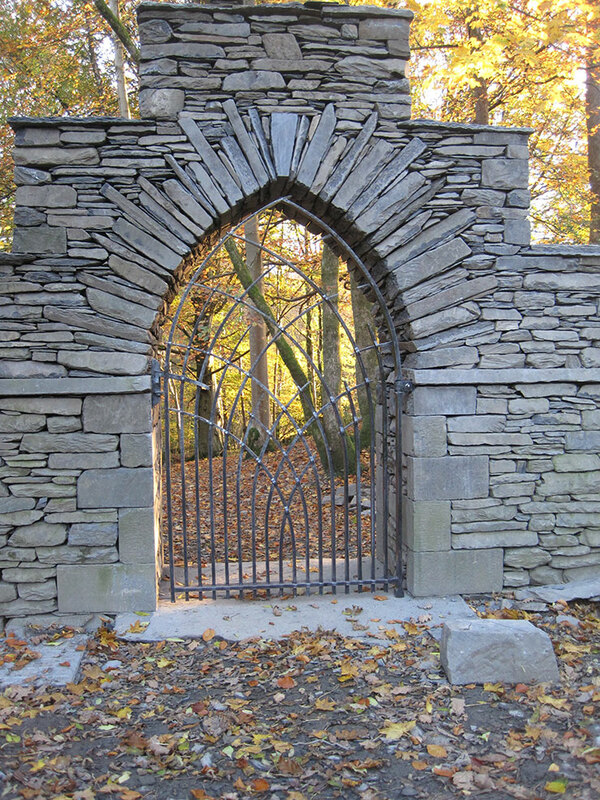 The arch must also have some stone work above the arch rather than just the copings. Sloping Ground – This again is probably not a usual option for the timed test due to its difficulty and the fact that your stone will be constantly on the run down the hill. The technique is identical to the Advanced Test Part A though in the Master Craftsman Test it is a good deal steeper at 30 degrees or over. The test schedule requires that all these features lie within 30 sq metres of wall at master’s standard, although it need not all be the same wall, that is to say the total 30 sq metres can be made up of different walls at different locations as long as the distance between them is reasonable for the examiners to travel. This obviously would not apply if the features were all built on a test site as opposed to in a work situation. Each individual feature must lie within a minimum of 5 sq metres. Please remember these features are to be built in optimum conditions on a site of the candidate’s choice, from stone of the candidate’s choice with no time constraint. 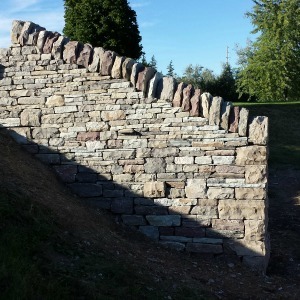 This is a Master Craftsman test, it is the highest qualification available in dry stone walling, the work needs to be of the highest quality, no excuses. When the selected features have been completed it would be wise to consider getting them marked at a time of the year that will offer the candidate the best chance of passing the timed test in the allotted twelve month period allowed. If the candidates features are marked lets say in November then the first four months available are probably not the best for attempting a timed walling test given the lack of day light and inclement weather. I would personally opt to undertake my timed test in spring. If this first attempt is unsuccessful then all summer and autumn is available for further attempts until the twelve months have elapsed. Next time I will cover the Master Craftsman’s timed test, the ultimate test of a waller’s skill and stamina.